sarahf (Sarah Frostenson, politics editor): Former vice president Joe Biden has consistently led in early primary polls, and in head-to-head polls against President Trump, but he still hasn’t entered the 2020 Democratic presidential primary (although he’s expected to declare in April). Is it possible that the stakes of running in the Democratic Party have shifted so much that Biden now poses too much of a liability? meredithconroy (Meredith Conroy, political science professor at California State University and FiveThirtyEight contributor): It’s too early to say whether these sorts of stories about Biden, which have been circulating for years, are enough to sink his chances. But as FiveThirtyEight’s Clare Malone said on the politics podcast, the way Lucy Flores has told her story recasts the incident as a more serious allegation, and less as late night talk show fodder. perry (Perry Bacon Jr., senior writer): A candidate who leads in the polls and has some major figures in the party clamoring for him to run is in a pretty good position to weather this kind of controversy, I think. Prominent female Democrats, like Nancy Pelosi, are even saying what has emerged over the last week is not disqualifying. natesilver (Nate Silver, editor in chief): I don’t quite know what to think. If you follow the reaction on Twitter, a lot of people think the accusations are a big deal for Biden. But, a lot of those people didn’t have Biden as one of their top choices to begin with. The biggest outstanding question I have for Biden is — where are the “party elites” clamoring for him to run. He has three endorsements — granted, you might not expect him to have many since he isn’t running yet — but two of those are senators from Delaware (his home state) and one is California Sen. Diane Feinstein, who is not a bad endorsee but also not the voice of a new generation of Democrats, exactly. perry: I definitely think you are seeing people who were inclined to support a more moderate figure and people who are older defending him. Polls show Biden doing really well with older Democrats (age 50 and older) and not as well with young voters. People who are younger and more liberal seem more inclined to attack Biden, but I suspect they weren’t that excited to see him run in the first place. meredithconroy: I was having this conversation with some friends (I’m fun at parties) about whether Biden tests the “Party Decides” thesis if he doesn’t get elite support, but still wins the nomination. My thought is that he doesn’t necessarily need institutional support to win. He has enough name recognition and goodwill (even now) to run and win without endorsements. I’m also in the camp that in today’s social media environment, the process is candidate-centered and not party-centered, and therefore the “Party Decides” idea is moot, but that’s a conversation for another day. natesilver: I don’t know, I think what former President Obama does, in particular, is important. A lot of Biden’s popularity among rank-and-file Democrats stems from his association with Obama. If Obama endorses, say, Kamala Harris instead, that would be a pretty huge deal. And I tend not to think that Obama would do that, at least not in the early stages, but the lack of support for Biden is something that voters might notice. Maybe. My question is not so much whether Biden can find a constituency within the Democratic Party, but whether he can be a unifying figure. And that seems harder now. Maybe the Flores accusations are partly a proxy for larger, generational issues, which is not to say they aren’t serious unto themselves. Still, this is a part of the party deciding, if you will. And the fact that Biden doesn’t seem to be able to control the narrative is a negative for him. perry: So they seem like two different issues. One, is this disqualifying for Biden as a candidate? The second question is how this changes the nature of his campaign if he enters. I assume this guarantees that his first week or so as a candidate will be dominated by questions about how he treats women. And the overall campaign environment will be hard. Biden will have to be more disciplined –and he is not known for that. natesilver: Just thinking out loud here: There’s also the case to be made that things get better for Biden if he runs. If you’re sitting on the sidelines, just one narrative can dominate the conversation about you, e.g. Elizabeth Warren and the DNA test. But once you start running, you generate other sorts of news and create more context. meredithconroy: Right, once he is in, he’s able to fill in this vacuum. But the Democratic Party is increasingly the party of women’s rights and equality, so I do think his pitch is going to be harder to sell. sarahf: Granted, this story is from January, but even then, there was a perception that no major candidate was waiting on Biden to decide before they decided to run themselves. Do we think that’s accurate? Or do we really think Terry McAuliffe and maybe Michael Bloomberg are sitting in the wings, still waiting? natesilver: I’m sort of torn. Because it can both be true that Biden is much weaker than his clear No. 1 status in the polls would imply, and that he’s a little bit more formidable than sort of young-ish NYC/DC journalists might assume, and they’re the ones that drive a lot of the conversation. perry: If you lead in every poll, isn’t that a sign people want you to run? And just in talking to older black voters, they tell me they do want Biden to run, because they feel like he is the person most likely to beat Trump. And they are really fearful of a second term for Trump. This is anecdotal, but it’s not irrelevant. natesilver: He maybe has that electability argument going for him. The thing is that some of the other Democrats — notably, Bernie — have seen their poll numbers against Trump decline once they decided to run. And while Biden’s numbers are strong now, they’d presumably be set to decline as well. But I do think there’s a question here of: “Who will older voters be comfortable with?” Beto and Buttigieg will do plenty well with moderates (as well as liberals who don’t think of themselves as part of the left) under the age of 50. But that’s not really Biden’s constituency, and who competes with him for older Democrats? In the abstract, if there were similar accusations against Sanders or Beto, that would be a bigger problem, because they’re relying more on young voters, and young voters are much more likely to consider that type of behavior to be inappropriate. meredithconroy: I’m not so sure, Nate. 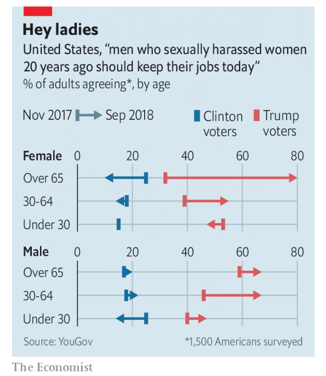 A poll from the Economist late last year found that a sizable percentage of Democratic women over the age of 65 are less willing to tolerate sexual harassment from men. Biden could be in trouble with older women voters. perry: But Biden is somewhat unique in that he appeals to both moderates and older people, and not just older-white-guy moderates. He is not ex-Gov. John Hickenlooper of Colorado (who is already in the race) or former New York Mayor Michael Bloomberg or Sen. Michael Bennet of Colorado (both of whom are thinking about running). Those three are likely to find few voters outside of older, moderate white male Democratic voters. This means if Biden does not run, I think that’s not just good for Hickenlooper or other older white men. I think that’s good for almost everyone, particularly any candidate who’s looking to win the support of black voters, older voters and party loyalists. sarahf: I think that’s right, Perry. That if Biden didn’t run, that’d be good for practically everyone. He really is the only candidate who fits the bill as a member of the establishment’s old guard. Which means if he didn’t run, there could be a pretty diverse coalition of support to split among the other candidates. perry: But if Biden does run, I think that Bloomberg, former Gov. Terry McAuliffe of Virginia and Montana Gov. Steve Bullock in particular don’t have much of a path. They probably didn’t have much of a path even if Biden didn’t run, but Biden does kind of take up the “electable man” lane, particularly with Mayor Pete, Beto and Booker also in that space. Rep. Seth Moulton of Massachusetts and Rep. Tim Ryan of Ohio should be hoping Biden stays out. Run, Joe, run! We need fewer candidates! Help us. meredithconroy: Ha. Question: Is Biden more electable because he can win over aggrieved Republicans and moderates? That’s the story, right? That he is more broadly appealing than a liberal like Sanders or Warren. natesilver: I do think there’s a fair amount of evidence that moderates over-perform candidates on the wings, other things held equal. So that part of Biden’s electability argument isn’t bad. He also has better favorables than any of the other Democrats for now, although that could very easily change. meredithconroy: Sarah, if you buy into the “white guy lane,” Biden definitely takes votes from the other white guys. natesilver: I’m going to give a slightly counterintuitive view. I think the candidate who might be helped most by Biden not running — or hurt most if he does run — is Kamala Harris. Biden’s popularity with black voters is a problem for her building a constituency. I also wonder if some “party elites” might come off the sidelines for Harris if Biden were to decline to run. perry: Harris is probably one of the most establishment-friendly candidates in the race, so big donors and people who backed Clinton in the 2016 primary would, I’m sure, prefer her over, say, Sanders. But don’t you think if Biden didn’t run, maybe there’s an argument that it would help Beto most? natesilver: It’d help Beto, but there’s a pretty big generational divide between his support and Biden’s, I’d gather. On the “party elites” side, I think it might push some older, moderate endorsers to back Beto. But I think he might have to prove his case more to older voters. perry: For the party-elite types who think a woman can’t win the general election (not a view I agree with but I hear it from a lot of rank and file voters), Biden not running is probably good for Beto. But in terms of voters, Harris and Booker are probably helped a lot if Biden doesn’t run. They could get more of the non-Sanders vote and the black vote. natesilver: I suppose it’s also possible that some ex-Obamaworld people are torn between Biden and Beto, so Biden not running could free up some staff talent and big donors, too. perry: Are we sure it would not help Sanders? natesilver: It could help Bernie, sure. perry: Like if you are in second place and the person in first place removes himself from the race, that is good for you, right? natesilver: Yeah, every other candidate’s chances go up. And Bernie is actually the second choice of a plurality of Biden voters. Although I do wonder if some of that is name recognition. sarahf: Yeah, I’m curious how that changes as we get farther into the cycle. natesilver: The dynamic I don’t like if I’m Bernie is if Biden doesn’t get in, which would probably help the party establishment settle on one (non-Bernie) candidate. perry: After watching 2016 (when the GOP establishment failed to consolidate around an alternative to Trump), I’m more skeptical that will happen, but maybe Democrats are more disciplined than Republicans. natesilver: I mean, you could certainly draw some parallels between Biden and Jeb Bush. Bush wasn’t off to a very good start, but he also froze party elite support, stopping it from going to other candidates. The flaw in that parallel is that Biden is polling at 30 percent instead of 10 percent or what have you. meredithconroy: In 2016, I think the GOP party elite sat out because of a lack of good candidates. But in 2020 I think Democrats are sitting out because there are so many good candidates. So I think this year some party elites are frozen, waiting for Biden to decide. natesilver: Part of me wonders whether Biden might go nuclear on Bernie, which could have a variety of effects. The Biden campaign is already (anonymously) blaming Sanders for the “handsy” stories, which seems a little weird because it seemed inevitable to me that those were going to become a topic of conversation anyway. sarahf: But I guess as to the question of whether Biden could be a unifying force in the party — these allegations seem to undermine that idea. And point to the fact that he might be out of touch, or not the best representative of the direction the Democratic Party is moving. Do we think that’s a fair way to think about how these allegations impact Biden’s candidacy? perry: If Trump’s approval had jumped to 48 percent after Attorney General William Barr issued a four-page letter on the Mueller report to Congress, this would be all different. A lot of the force driving Biden’s potential candidacy is electability. And so if Trump looked really strong right now that would help Biden. perry: I’m not totally sure I think Biden’s situation as a candidate is that different than it was two weeks ago. Some parts of the party that already wanted him to go away are now saying that in public, but he still has strong poll numbers and is in good standing with the party’s elected officials (Pelosi). Biden has not been eliminated by this controversy. But it has to have shown him that this will be a tough campaign if he enters. And he hasn’t entered yet, which tells me there must be some hesitancy on his part. meredithconroy: Maybe the question (for another chat) is what kind of scandal rises to the level of hurting a candidate in the general election. natesilver: Sure. It’s part of the process of the party deciding. Seeing who the party defends and who it doesn’t is important, as well as how capable candidates are at handling negative stories. But part of the process is also testing the candidate’s electability argument and looking for flaws that could cost them the general election. The weird thing about the Biden story is that it’s very hard to see Trump, for obvious reasons, pressing back on Biden too much without it backfiring. meredithconroy: You’d think so, right? But I think Republicans are happy to keep scandals like this Biden story in the news. The more that accusations against men that don’t seem to rise to the level of harassment are litigated online, the more conservative voters are mobilized against something that they find really fishy in American politics today, which is believing women to a fault. Or falsely accusing men. natesilver: Yeah, that’s a fair point, Meredith. So maybe we are overlooking the possibility of a backlash to the backlash against Biden? I don’t want to reveal too much because it was a private conversation, but I was talking to an older (male) Democratic friend this weekend and I’d guess he’s probably more likely to vote for Biden now than he was before. He was also very against how Democrats handled the Al Franken accusations. And Kirsten Gillibrand’s campaign seems to be totally flatlining in part because she spoke out about Al Franken and Bill Clinton. Democrats have become the party that voters trust more to handle incidents of sexual harassment and misconduct. A candidate who is known for being “handsy” with women, could jeopardize this. natesilver: I think these accusations are likely to be more of a problem for Biden among party elites than among rank-and-file voters, but party elites are important, too.